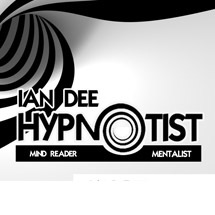 Ian Dee is one of the UK's best loved Comedy Hypnotist and Mentalist Mind Reader acts. Performing his show throughout the entire country, Ian is available for hire as a top Hypnotist and Mentalist. He performs his Hypnotist Stage Act for both public venues and celebrity parties. How to Hire a Hypnotist ... You've got a big event coming up. Maybe it's a birthday; maybe it's a wedding; maybe it's a cabaret event or a corporate event. Whatever the reason, you've decided to celebrate and you decided that your celebration will include a hypnotist without exception the best choice for any adult celebration. So what's the best way to go about hiring a hypnotist? A good way to start is by looking for hypnotist videos on there websites. A lot of hypnotists have tapes of themselves performing on stage on there web page. Book with complete confidence! Safety is a major concern during a Stage Hypnosis show, and Ian Dee takes it very seriously. Ian is a member of F.E.S.H - he follows the guidelines set by The Federation of Ethical Stage Hypnotists, and carries full Public Liability Insurance. Keep up to date with all the latest news and shows by liking Ian on face book, following him on twitter or checking out his videos on youtube! Evaluating the suitability of a hypnotist can be a tricky thing! What are some of the important things to clarify before you hire a hypnotist? From websites to video clips, to testimonials, there are ways to find out how the hypnotist has performed at previous shows.! If you need to hire a hypnotist for any even in the UK be it in London, Manchester, Peterborough, Grimsby, Birmingham, Liverpool, Leeds, Sheffield, Coventry, Blackpool ,Cardiff ,Swansea , Edinburgh, Glasgow, Dundee, Nottingham, Derby, Hull, York, Carlisle, Newark ,Lincoln ,Newcastle, Sunderland, Middlesbrough then Ian is the ideal candidate. an Dee's Hypnotist Stage Show is ideal for: Parties, Weddings, Universities and Colleges, Schools, Student and Society Balls, Social Clubs and Pubs, Holiday Parks, Corporate Caberet and can be hired for many other entertainment venues. He is always willing to discuss possible bookings throughout the UK, Europe worldwide. He is also available for corporate, cabaret, variety, theatre, holiday camp, NAFFI & military, plus college & university, events, functions, ball ,banquet and party. Club, pub or agency work are also high on his priorities. He also does birthday parties, stag night, hen nights, wedding receptions, wedding aniverseries ,school proms, conferences, product launches and TV appearances, you name it and Ian Dee is willing to discuss hypnosis party ideas with you about his comedy hypnotic show. There is also useful information regarding FAQ on hypnosis, the laws concerning booking a hypnotist show, access to the Review of Hypnotism Act 1952, some useful information to know before booking a hypnosis show and some very interesting links to great resources about hypnosis, details of other hypnotists, entertainers and entertainment related interests. The site also contains a useful dictionary of hypnosis and NLP terms, a history of hypnosis and a history of the stage hypnotist & hypnosis shows.